Beyond the Sublime presents Welsby’s seminal 16mm films in their entirety. Streamline, 1976, colour sound, 16mm, 8mins, UK. This film was made on Mount Kinderscout in Derbyshire, England. It is a continuous, "real time" tracking shot of a stream bed. The camera was suspended in a motorized carriage running on steel cables three feet above the water surface. The camera pointed vertically downwards recording the contours of the stream bed and the flow of water along its course. Windmill III, 1974, colour silent, 16mm, 10mins, UK. The camera films a park landscape through the flat mirror blades of a small windmill. The rhythm and pacing was determined by the speed and direction of the wind. Wind Vane, 1972, colour sound, 16mm dual projection, 8mins, UK. The location for this film is the western end of Hampstead Heath in London. 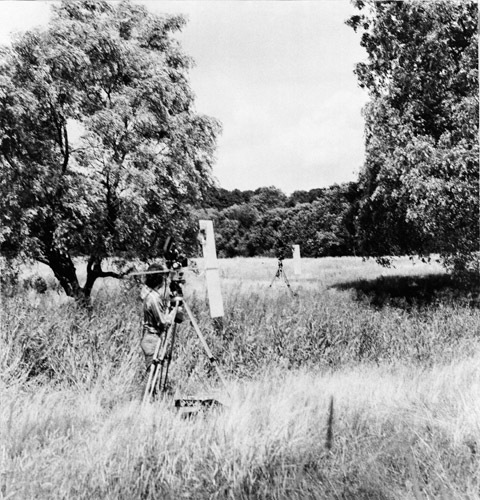 Two cameras mounted on tripods with wind vane attachments were positioned about 50 feet apart along an axis of 45 degrees to the direction of the wind. Both cameras were free to pan through 360 degrees in the horizontal plane. The movements of the two cameras, which were filming simultaneously, were controlled by the wind strength and direction. Seven Days, 1974, colour sound, 16mm, 20mins, UK. The location for this film was by a small stream on the northern slopes of Mount Carningly in southwest Wales. The seven days were shot consecutively and appear in that order. Each day starts at the time of local sunrise and ends at the time of local sunset. One frame was taken every ten seconds throughout the hours of daylight. The camera was mounted on an equatorial stand which is a piece of equipment used by astronomers to track the stars. In order to remain stationary in relation to the star field, the mounting is aligned with the Earth's axis and rotates about its own axis at approximately once every 24 hours. Rotating at the same speed as the Earth, the camera is always pointing at the either its own shadow or the sun. Drift, 1994, colour sound, 16mm, 17mins, CAN. The overall feel of Drift is sombre and mysterious; a study of winter light falling on the surface of water, metal and cloud. There is little land in this film and very few landmarks from which to navigate from one space to the next. The picture plane is in continuous motion like the ocean which, on the surface at least, is the subject of Drift. River Yar, with William Raben, 1971-72, colour sound, 16mm dual projection, 35mins, UK. Shot through an upstairs window in a water mill on the Isle of Wight, overlooking a tidal estuary. A camera recorded one frame every minute (day and night) for two separate three-week periods in autumn and spring.